Thanks for stopping by! My name is John Muldoon, and I help people get better results from their online marketing. I’ve been consulting with entrepreneurs for the last 10 years, and I’ve helped hundreds of businesses improve their conversion rates. If this is your first time here at Conversion Leverage, you should check out the Start Here page. 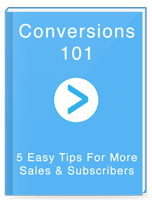 If you want to learn more about Conversion Rate Optimization (CRO), then check out the free Conversions 101 guide in the sidebar. You can also check out the tools I recommend, or send me a message if you want to get extra help or hire me as a consultant.